Let it Go! Spring Fling #Giveaway! $60 Disney Gift Card and LE Flower and Garden Pin! | Focused on the Magic : Let it Go! Spring Fling #Giveaway! $60 Disney Gift Card and LE Flower and Garden Pin! It's been a long rough winter for many of you and I bet you are happy to let winter go and welcome in spring. 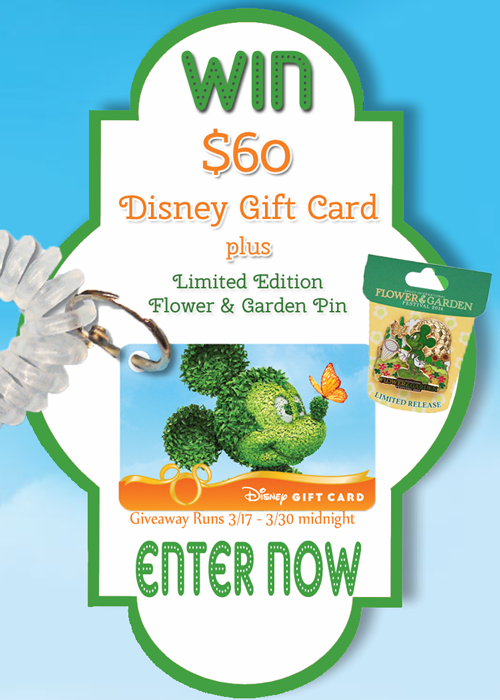 To celebrate the arrival of spring and the Epcot's Flower and Garden Festival we are having a Spring Fling Giveaway!We are offering one lucky winner a $60 Disney Gift Card and a Limited Edition Flower and Garden Festival Pin!